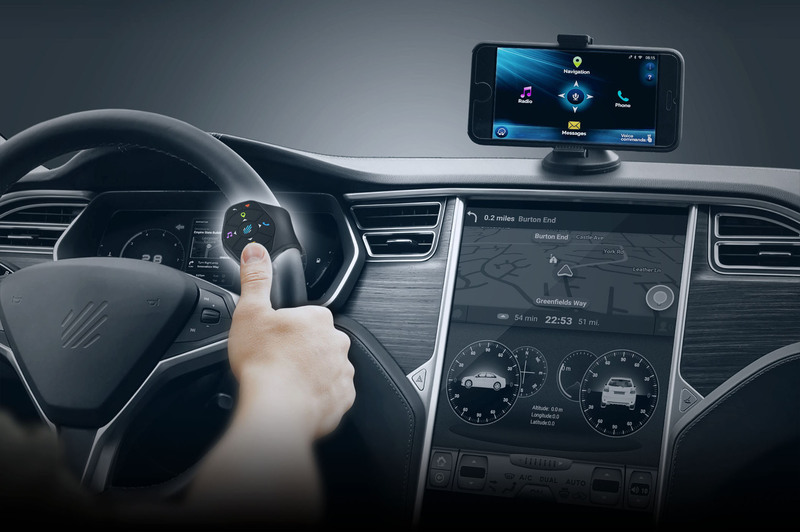 A unique steering wheel Bluetooth remote control & Android app that allows every driver to enjoy connectivity while driving safely. The first distraction-free interface for infotainment systems, enables drivers to experience seamless eyes-free touch and voice control. Your drive is important to you, so is your safety. Your car’s multi-media screen shouldn’t be dangerous. Your infotainment leads to distraction from the road ahead visually, manually and cognitively. Let’s make driving great again by letting technology do all the work for you, without the distraction. Inpris's Sightless Touch technology is designed to be used sightlessly. 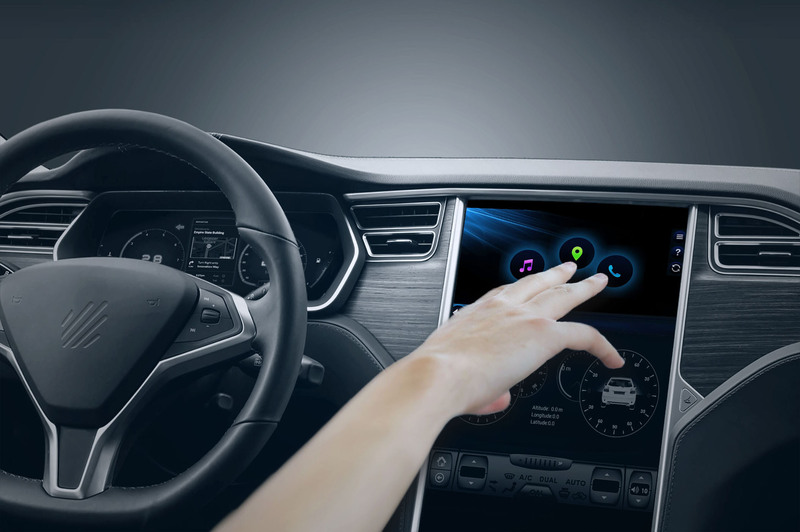 Instead of looking at the screen and touching a particular area as in the standard touchscreens, the technology maps the hand of the user and assigns each finger a specific role within their car’s multimedia. By using different fingers for different interactions and conforming the screen to your finger’s location, Inpris's Sightless Touch enables you to control the infotainment system without looking at the screen. Lightning fast motion detection, eyes-free usage, and multi-finger interaction are just a few of the benefits of the Sightless Touch technology. Get your jam on within seconds. No more shuffling through menus to find what you want to listen to. Pre-define your favorite playlists and songs to get you groove on when the moment hits or configure your favorite radio stations to be launched in a moments notice. Just use your index finger to swipe, and get it going! Use your middle finger to navigate your way. Whether it’s home, a dinner date, or grandma’s – find how to get where you need to go, now. Talk with anyone within a moment’s notice. Inpris's Sightless Touch helps you communicate quickly and safely using your infotainment by taking the distraction out of searching for favorite contacts. Launch a phone call right away with Sightless Touch’s pre-defined contacts and favorites. Use your ring finger and swipe up to call home or left to call the office, whichever way you slide, you’ll be talking in seconds. Sightless Touch makes it easier to get where you need to go. No need to dictate your destination to a bulky voice recognition system or search through screens, a single swipe of your middle finger is enough to start navigating to your destination immediately. For cars with multiple drivers, Sightless Touch identifies your profile when you get in the car and is ready with your pre-defined destinations and settings. Inpris’s Sightless Touch technology was designed to be used sightlessly. Instead of looking at the screen and touching a particular area as in the conventional touchscreens, or shout in the car hoping that the system will understand, the technology maps the hand of the user and assigns each finger a specific role within their vehicle’s multimedia. By using different fingers for different interactions and conforming the screen to your finger’s location, Inpris’s Sightless Touch enables you to control the infotainment system without looking at the screen. Lightning fast motion detection, eyes-free usage, and multi-finger interaction are just a few of the benefits of the Sightless Touch technology. Use your pointer finger to change the song, search a playlist or play the radio. The power of your music and radio, at your fingertips. Use your ring finger to call the ones you love, let work know you’re running late, or order take-out. You are never further than a swipe away from your next call. Talk with anyone within a moment’s notice. Inpris’s Sightless Touch helps you communicate quickly and safely using your infotainment by taking the distraction out of searching for favorite contacts. Launch a phone call right away with Sightless Touch’s pre-defined contacts and favorites. Use your ring finger and swipe up to call home or left to call the office, whichever way you slide, you’ll be talking in seconds. I want InprisWay, how can I get it? Wait, don't you use voice commands? How long does it take to learn how to use InprisWay? I want Sightless Touch, how can I get it? How long does it take to learn how to use the Sightless Touch?